Abstract: H2O2 is a reactive oxygen species (ROS) that is measured in cells as a marker of oxidative stress. It is also measured as a marker of enzyme activities that either consume or produce H2O2. It is desirable to screen chemical compounds for their capacity to alter H2O2 levels in cultured cells or for their effects on H2O2 levels in enzyme reactions. Current fluorescent assay formats are prone to false hit rates that are too high for efficient screening applications. 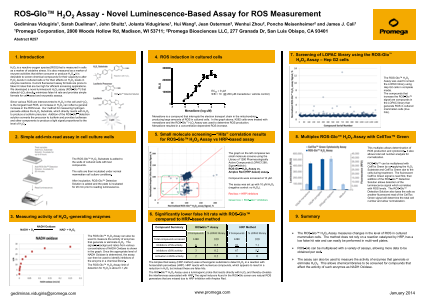 The ROS-Glo™ luminescent H2O2 assay detects H2O2 directly, minimizes false hit rate and provides simple formats for cell-based and enzymatic assays.